Lorna Barrett's Booktown Mysteries are on my auto-buy list. I buy every new book in this series, and lately I have been starting them without even reading the synopsis on the back. Why would I dive into a book without knowing what the story was about? Because I know whatever Tricia and Angelica Miles are up to I'm going to love it! Whatever course Lorna Barrett has put my two favorite booksellers on, I'm going to enjoy every single minute of it. 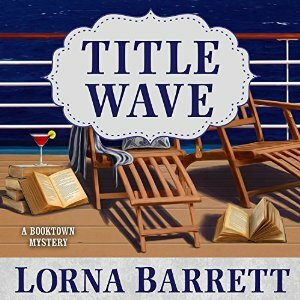 And, I'm pleased to report that in Title Wave I was proven correct once again, as Lorna Barrett delivers a stunning, unputdownable mystery! I love Stoneham, New Hampshire, where every booklover's dream comes true. An entire picturesque town full of bookstores, with a store to cater to even the pickiest reader! However, after the rollercoaster that was the previous book in this series, I was delighted that Lorna Barrett chose to take our favourite characters out to sea for some much needed R&R. Of course, where Tricia goes trouble seems to follow! What starts as R&R (which of course is reading & relaxation!) turns into murder, when an author on the cruise turns up dead. After I turned the last page (or in my case heard the last words of the audiobook) I felt like Lorna Barrett really outdid herself with this one. Stoneham is a booklover's paradise and the cruise ship was like reader's paradise, as we discover more about authors, how they interact with other authors, publishing and meddlesome readers too! I'm always curious about the world behind the cozy mysteries I love so much, and I love how we get a sneak peek into it, in Title Wave. While I enjoy the thrill of discovering new series, I love sinking back into a long-running, much loved series and for me the Booktown Mysteries are the epitome of that. Not only have readers watched murders be solved, but we've watched characters evolve, meet, get married and even have children. We've followed their lives, and delved into their backgrounds more. I love that Lorna Barrett never shies away from adding color and complications to her characters. Tricia and Angelica seemed to not be close to begin with, when Angelica first arrived in town, but they've spent more time together and their relationship has grown and blossomed. In Title Wave we saw what brought about some of the tension in their lives, and I enjoyed reading more about their past. I enjoyed listening to Title Wave on audiobook, as it took me away on a cruise, where trouble runs amok. Whether it's in print or audiobook, this series doesn't disappoint and I can't wait for the next book! A review blog for cozy mysteries only.